If you’re not already acquainted with Simply Saucer, let this be your chance. 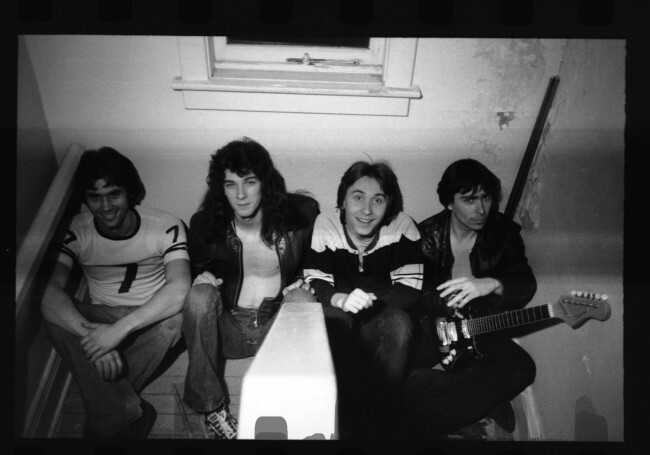 As the ringleaders to the early ’70s Toronto/Ontario punk scene, the band got their name from a Pink Floyd record, but took a much tougher, Stooges-influenced approach to their playing. During their original run they recorded only one LP, the classic Cyborgs Revisited, but it unfortunately did not see release until ten years after their breakup. The record is a truly amazing collection of forgotten space rock, but nestled in the middle of its nine blistering tracks is one track that sounds completely unlike the others. Rock writer Jesse Locke says, “‘Bullet Proof Nothing’ is an anthem for the used, abused and confused, a sarcastic love song from the mind of a sadomasochist, and the eternally ear-catching single that should have been.” We say that just about hits the nail on the head. Now Mammoth Cave Recording Company has just announced that they will be releasing “Bullet Proof Nothing” as a 7-inch for the first time with a previously unreleased live recording of the song as the b-side. The single is currently available for pre-order, but with only 500 being pressed, they are sure to sell out soon. Pick it up here while you still can.